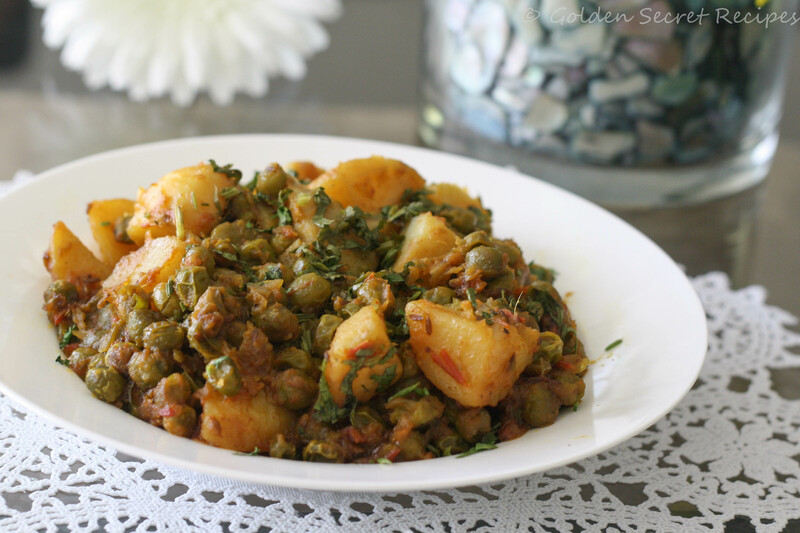 Aloo mutter is one of the most common side dish we make with chappati. Aloo means potato and Mutter is green peas. Most North Indian recipes of this type would call for potato and I love that, coz I love potato in any form :- D. You could make this dish with gravy or a drier version. I prefer the dry version. This goes well with chappatis or pooris or even jeera rice. You can make similar curries with various vegetables like Baingan(Eggplant), Gobi(Cauliflower), Lauki(Bottle Gourd), Green peas and Paneer etc etc. This is a very basic recipe and fairly simple. Doesn’t require too many fancy ingredients. With this same approach you can make dry sabjis with various other vegetables like okra, beans, cabbage etc. I will post that recipe one of these days. Enjoy! 1. Heat oil in a pan and put cumin seeds. When it splutters/turns brown, add chopped onion, ginger garlic paste, half of the salt and chopped green chilli. 2. Cook in medium high flame and saute occasionally. 3. Once the onions turn pink, add turmeric powder and red chilli powder. 4. Saute for 1-2 mins till the spices cook well. Then add garam masala powder. Note: If you want a thick sauce where the onions dissolve into the gravy, cook onions really well till it turns brown and oil starts to separate. 5. Then add tomatoes and saute well. Let it cook well in medium flame. You will know that it is cooked through when the oil starts to separate. 6. Put cubed potato, green peas and the remaining salt. Add some water also. Give it a good mix. Cook covered in medium flame till the vegetables cook well. 7. Occasionally pour some water and stir well so that the spices/masala doesn’t stick to pan or get burnt. If you want more gravy, add enough water to form gravy and let it boil. 8. Once the vegetables cook, cook uncovered in medium high flame and sauté well. If you want dry sabji/aloo mutter, cook till all the water evaporates. 9. Remove from heat and garnish with chopped coriander leaves. 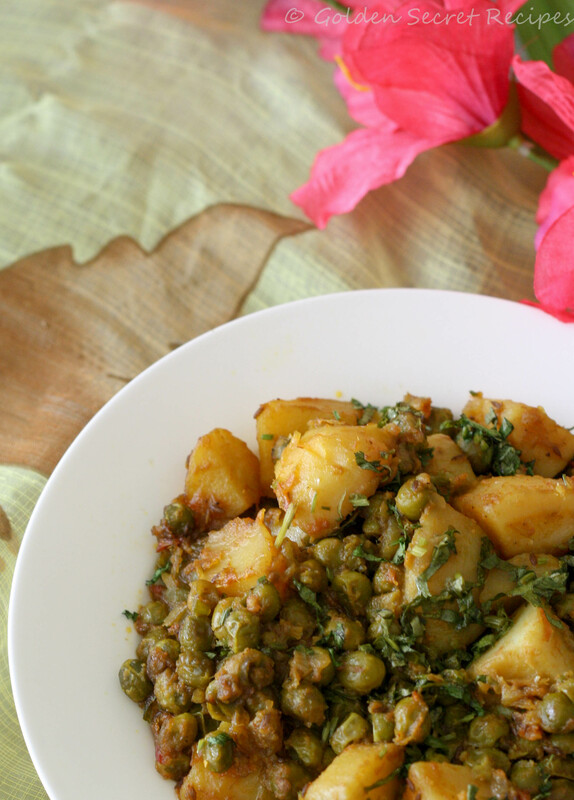 Serve with warm chappatis or jeera rice.